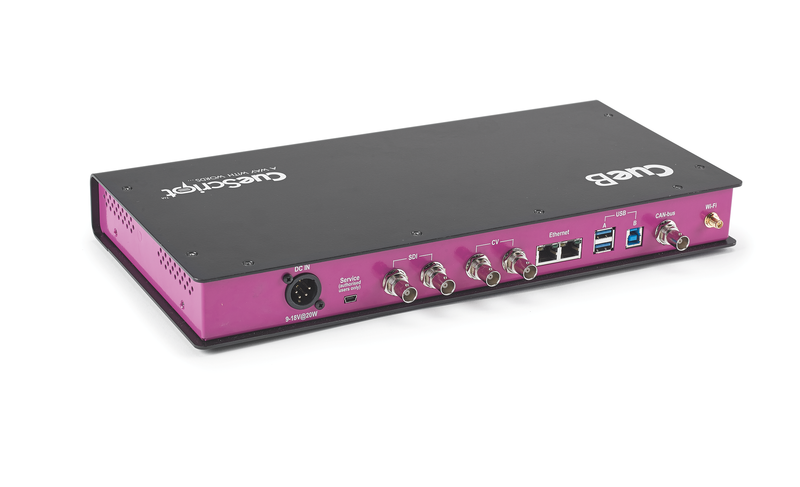 Connecting via Ethernet or USB, the CueB has a built in VDA (video distribution amplifier) offering 2 analogue video outputs and 2 HD-SDI outputs as standard. The sleek styled box allows connectivity of an unlimited number of scroll controls, wired or wireless, via Ethernet, CAN Bus over coaxial cable, or USB (direct to the computer), providing interchangeable control preference. Multiple CueB devices can run independently or simultaneously and a rack mount for the CueB is available. The CueB is included in both the CueiT Production and CueiT News software packages. Connects via Ethernet or USB. Analogue and HD-SDI outputs as standard. CueScript Scroll Controls connect via Ethernet, CAN Bus over coaxial cable, or USB direct to the computer.